We're pretty sure you're going to like Munich. Most people we know who go to Germany hit this great city if they don't see anything else. ...don't you think of a serious place with government officials and boring buildings? It's in the southern part of Germany. Truthfully, it might be best known for its fall festival of Oktoberfest. Beer is a big part of touring this great city with all its famous beer halls, but there is so much more. and the Rathaus looming over the whole pagent. What's this about Alpen horns? They're only 50 miles (80 km) away. 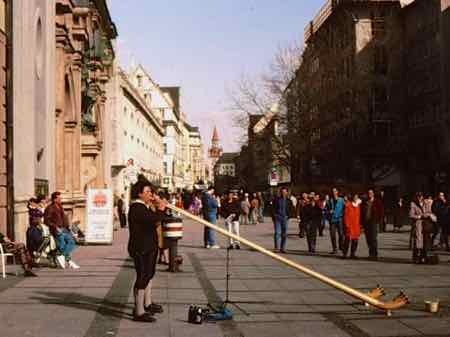 We encountered a group playing Alpen horns right there on the pedestrian street. The music and the people in Bavaria just seem more carefree than what you find in northern Germany. It's Munich in English, I'll say it's Munchen in German, but that's not really right... it needs those two little dots over the "u" or they'll tell you it's misspelled.... so Müchen. See? So what should you see in this fun loving city? 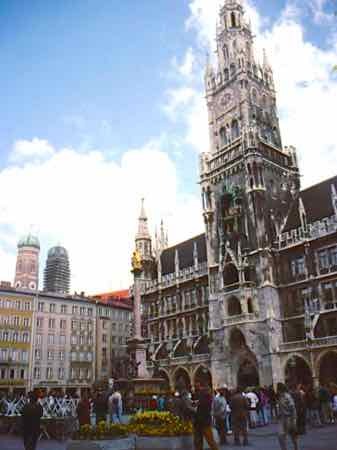 See the Marienplatz we mentioned above. Join all the other tourists to watch the Glockenspeil that graces the top of the Rathaus (the New Town Hall) put on its show at 11 am. And stay alert for concerts in them. It's like listening to angels, and I guess that's the affect the architects were hoping to have on you! One trip we got into the city on Easter. On Easter Monday, we wanted to see the Michaelskirche. We dashed in before they started the service, but as we were wandering out a little old German man stopped us from leaving... he kept saying, "freies Konzert." We decided to sit in the back row and see what he was talking about. The church ended up filling with standing room only, and we heard the most wonderful concert you can imagine.... we listened to those angels... for free. Sometimes you've just got to listen and act on serendipity. You'll also want to see the Residenz, the Palace in the middle of town. It can take you the better part of a day just to see the highlights. Its fabulous rooms are full of period furniture. Don't miss the treasury! I will never forget the little gold statue of St. George Slaying the Dragon that is encrusted with jewels. There are museums too... the Alte Pinakothek full of old masters and the Neue Pinakothek with paintings from the 19th and 20th centuries, but you could also visit... say... the BMW Museum. There is a whole list of museums to choose from. For meals why not try a beer hall? There are plenty to choose from in Munich... and while there will be lots of tourists in them... there will also be lots of locals and plenty of atmosphere and music. Most major airlines fly into the Munich airport. If you want to get straight to this fun loving part of Germany, why not fly directly in? Bus, trains and taxis are available to get you into town. The airport is only about 9 miles (15 km) from town, but it will take you about 45 minutes to get in from the airport to city center. So for a visit to the Bavarian corner of Germany consider starting in Munich where you can immerse yourself in culture and lots of fun.